A police officer’s fight for life was captured on camera as he shot a robbery suspect who stole his baton and attacked him with it. The attack took place in west Philadelphia on Saturday after a police officer was trying to arrest Sydney Clayton, 31 – who is believed to have been high on drugs at the time. The video shows Clayton struggling with the officer before grabbing his baton and beating him over the head with it. 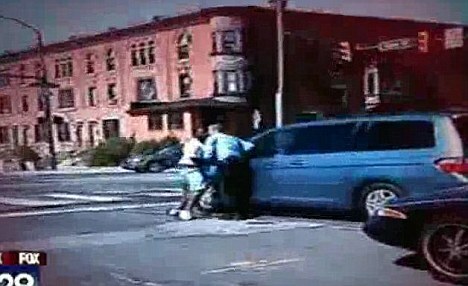 He moves away but then runs back and grabs the baton from the ground to attack him again, but this time the officer takes his gun out and shoots him several times. Despite being shot, Clayton continues to approach the officer and is only restrained and arrested after more police arrive. The shooting took place on the corner of North 52nd and West Jefferson streets beside a row of traffic. 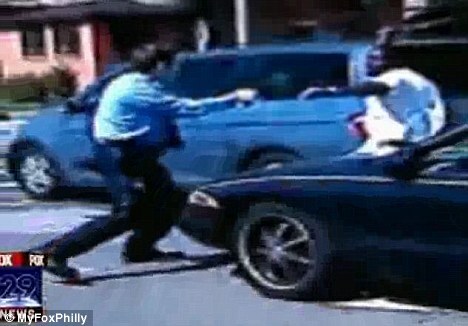 A motorist captured the incident on his cell phone camera. There were several shots which caused witnesses, including the person recording the video, to take cover. Clayton and the officer were both taken to the hospital for their injuries. Sydney Clayton remains in the hospital and faces a number of charges. He has 17 prior arrests for violence and drug related offenses, according to ABC. The officer is out of the hospital but his name has not been released.